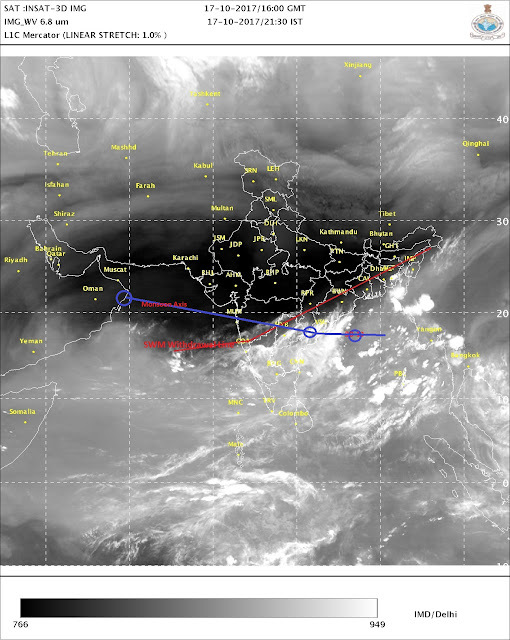 As per Vagaries, Monsoon has withdrawn from Mumbai and Maharashtra, Monsoon line shown in attached image as Red Line. Blue Line is Axis Line. Hot Divali days....Days will get hot in Mumbai on Wednesday and Divali day. BB-13, now located at 13.7N and 87.5E, remains of strength as of morning report, at 1002 mb.. Likely to strengthen and track towards South Odisha coast. At current status, likely to cross Odisha coast on around 19th as a depression. Heavy rains in coastal Odisha on 19th October. Bhubaneshwar will see increase in rainfall on 19th. BB-13 can track NE after crossing land . Sir night temperatures in north gujarat has started going down around 20s rightnow but days are still hot at 38-39. When will day temp start falling there. How does this anti-cyclone work? Does it helo in reducing the temperatures?